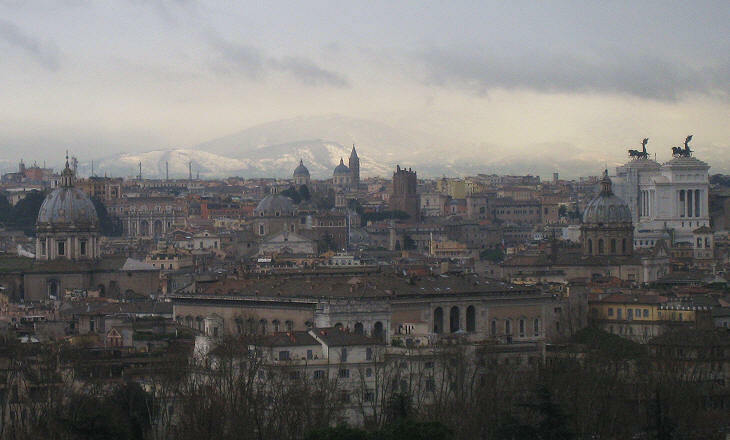 Similar to Horace, today's Romans have to watch the mountains to the east (Monte Gennaro) and to the north (Monte Soratte) of the city to see some snow. The Janiculum, a hill behind Trastevere, is the best observation point to see these mountains; in addition it offers a commanding view over the City of Rome (you can see it as it is today or as it was in 1765 in the Grand View of Rome by Giuseppe Vasi). 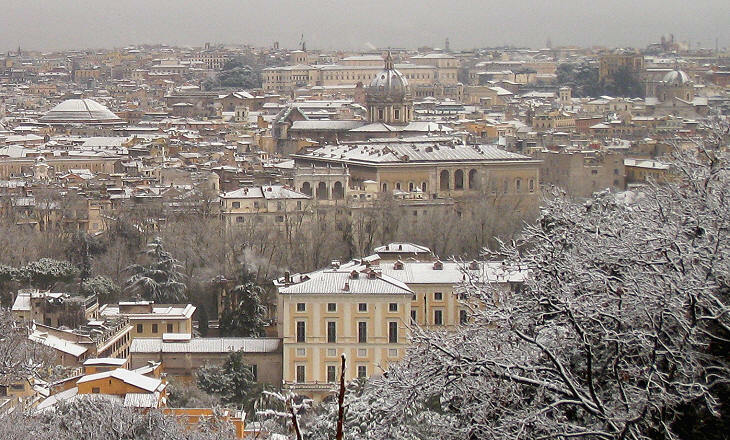 Although the Janiculum is just 60 metres (200 ft) above the City of Rome it has a greater chance that the snow will stick to the ground there, than in other areas. This is because it is covered by vegetation and therefore it is less affected by the impact of heating systems which raise the temperature of the air. At Rome there was a severe storm, and where the least snow fell it was not less than seven feet deep. (..) This was the first and only time when the atmosphere of this land departed from its customary temperature. 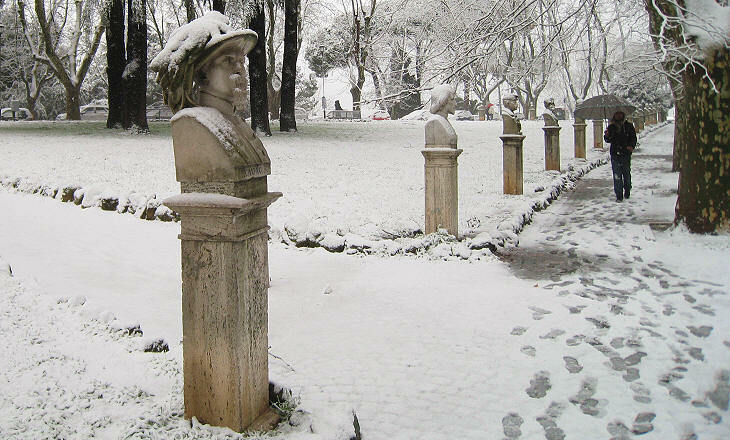 Dionysius of Halicarnassus was a Greek writer who wrote a History of Ancient Rome from its foundation to the First Punic War; he lived at the time of Emperor Augustus and he set the occurrence of this snowstorm during the war with Veii, some 400 years before his time, so his assessment of the snowfall was based on hearsay. 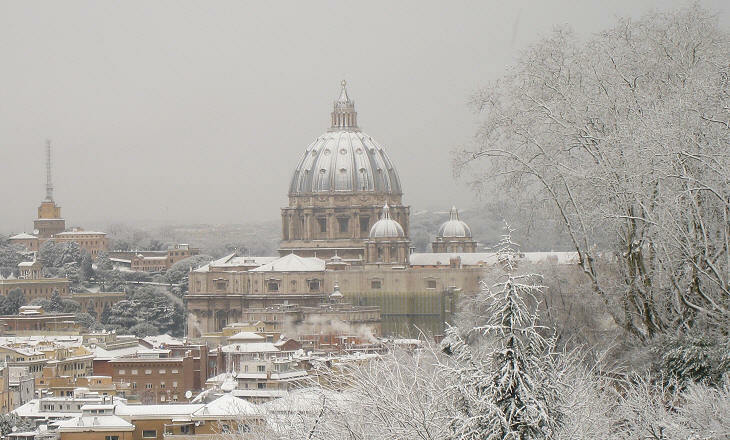 Another mythical snowfall is associated with the foundation of S. Maria Maggiore, one of the four great basilicas of Rome. 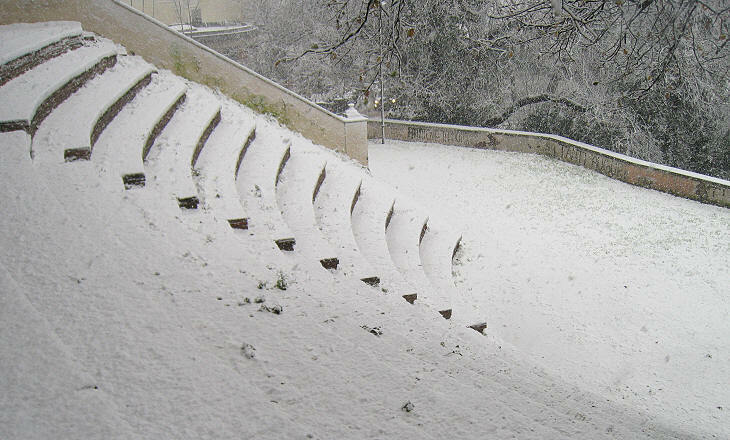 The snowfall is known as The Miracle of the Snow as it occurred on the night of August 5, 358. 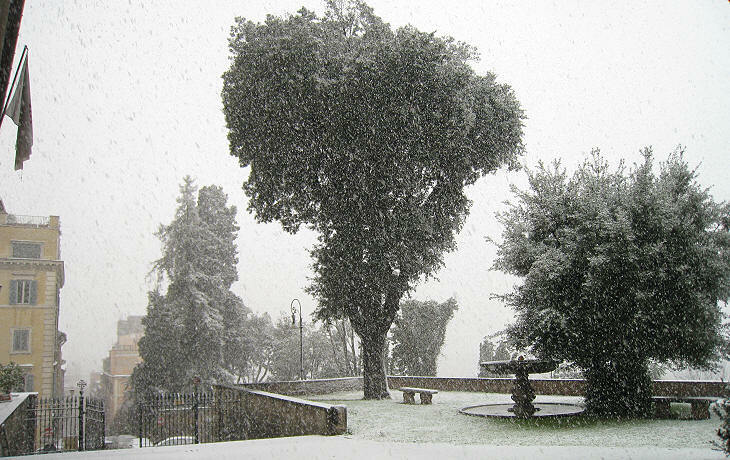 Miracles need no explanation; however, in this instance, considering the season, the ground might have been covered with hail, rather than snow; there are records of a hail storm which occurred in Rome on August 24, 1512 with hailstones having the size of an egg. 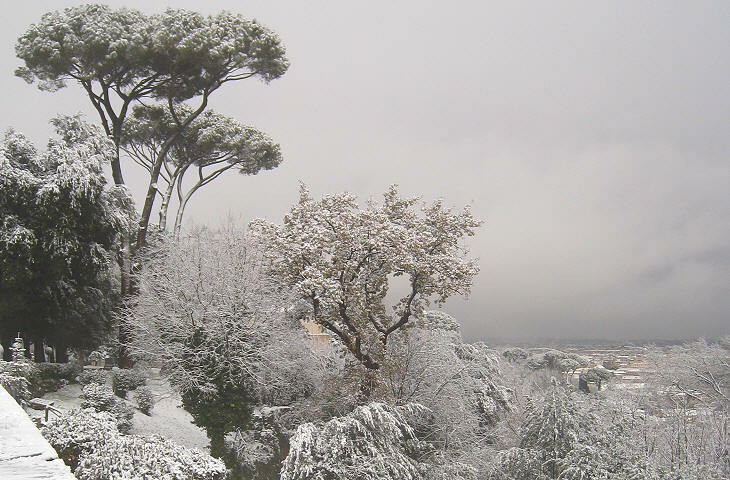 In the last two centuries 25 snowfalls of some relevance have been recorded in Rome so on average there is a snowfall in one winter out of eight; this explains why so many buildings of the city end with a terrace rather than with a pitched roof and why branches of the famous stone pines of Rome are not at risk of falling because of snow weight on the umbrella-shaped crowns they support. 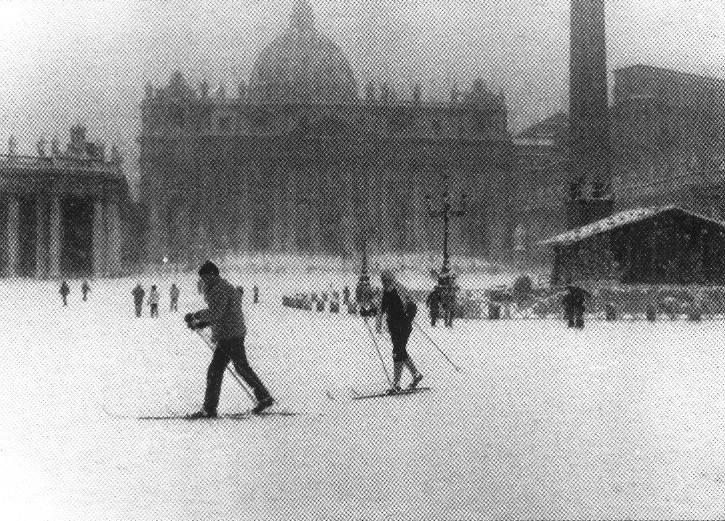 Perhaps the most important snowfall of the XXth century occurred in February 1956; Piazza S. Pietro was covered with four inches of snow (as you can see in a photo of Il Messaggero, a Roman newspaper); that winter was particularly cold and heavy snowstorms were recorded in different parts of the Northern Hemisphere including New Mexico and Texas. 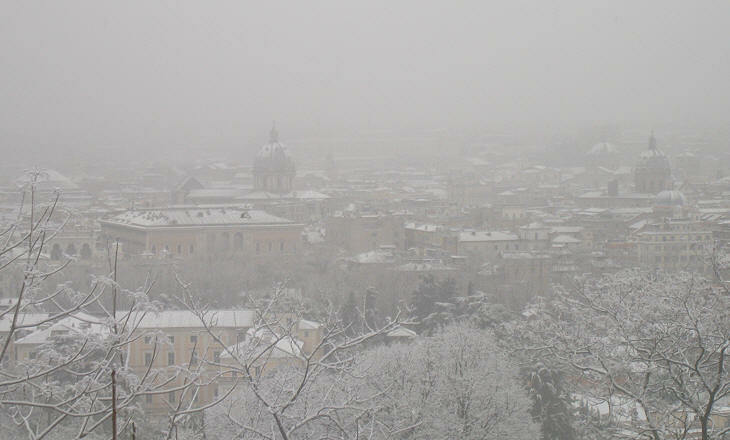 The winter of 1985 was known as that of The Snowstorm of the Century in Rome and Italy; it is mainly remembered for a bitter debate about the unpreparedness of local authorities in dealing with the snowstorm impact on transportation. At the beginning of January Rome was covered with snow: its public transportation system had several failures and the streets were not cleaned rapidly enough to avoid the snow turning into ice because of very low temperatures; some newspapers of northern Italy blamed the poor handling of the situation on the assumed traditional laziness of today's Romans; a few days later however it was the turn of Milan to face a severe snowstorm and notwithstanding its inhabitants are traditionally assumed to be hard-working people, local authorities failed to act promptly, following in the footsteps of their counterparts in Rome. The snowfall of February 10, 2010 was a minor one, however for one hour between 10:30 and 11:30 a.m. it was rather intense and it raised hopes of covering all the monuments with a thick white layer; unfortunately (from the point of view of someone who wanted to take pictures and of the students who played truant and came to the Janiculum in the hope of snowboarding) temperatures rose and a light rain cleared away the snow in a matter of minutes. 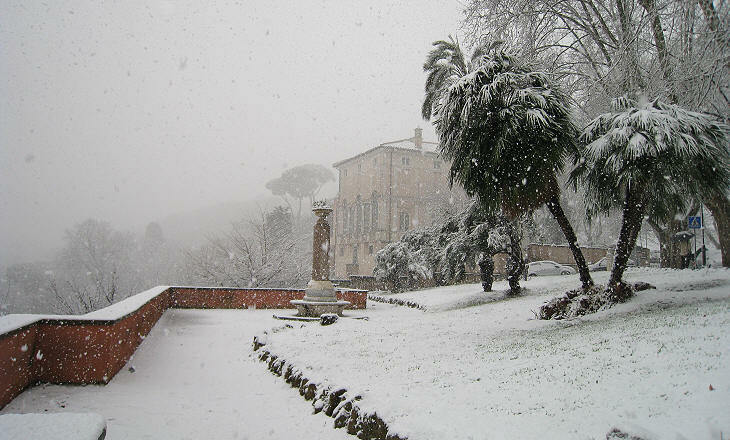 On February 4, 2012 a major snowfall struck Rome.